When I saw this I said to myself "uh oh, I'm going to have to delete this if it isn't from moodflow." Good thing it was. =) Very refined and pleasing, nice job. I have to say...I am not usually a fan of digital wallpapers, as I don't like things that look fake. But this is surreal, with fantastic detail that my eye doesn't point out as fake, and Damn cool to boot. Nice Job. Thanks for the compliments ;-) This is one of my favorite images too. i like this one.....it looks kind of like easter island on a planet with a very close moon...nice work. Beyond the Staples Center you can see America, With its tired, poor, avenging disgrace, Peaceful, loving youth against the brutality, Of plastic existence. I have looked at a ton of these digital images, but this is the first one that caused an audible "oooh!". Nice work, and the "beachcombers" are a special touch. I'd recommend that anyone (like me) who loves this goes and takes a look at Moodflow's site, there's some stunning work there. Thanks for sharing Moodflow. this is incredible! the colors, the light, the subject... everything's perfect! this is unbelievable, how d hell do u do that? I love this picture, humans can create such wonderful dreams, and as an image this is a place we go to in our dreams. I dont know why (there being water in it) but this immediately made me think of of the Dune books. Stirred the imagination, as all Good sci fi and digital art does. excellently done, cheers. We don't need rules to tell us right from wrong. Trying to be supportive of your art! I like this picture! I like the effect of the moon fading in the distance. WOW WOW WOW WOW WOW i love it. 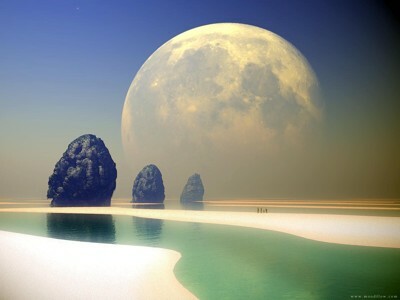 it reminds me of the beaches near here minus the moon and rocks . WOW!!!!!!!!!!!!!! Very Strong piece. I love it, cheers. Nice. I really like this one! Very nice picture. It shows your talent with the programs you use. I look forward to seeing more from you! Amazing! The heat from the atmosphere seems to be tangible as you look through it. Very well done. an amassing image. Art is the perception of the creator. Meaning is the perception of the viewer. acceptance is the perception of society. By putting in both the moon and the sandy beaches, moodflow creates the effect of it being both night and day at the same time. And by placing the figures in as miniatures, Moodflow also shows a wide perspective in this version of the march of the three kings. Don't know how I missed this one Jeff. 10 from me & saved. P.E.R.F.E.C.T. I woke up this morning in the Bahama's...' Coffee Break's Over '. Very nice. I really like this one. 10 x 10 and in my favorites. One of those pieces of work that i can't describe. So simple yet real. And also so stark. very very very good job! Youre pictures are amazing. You really need to look into becoming way more active in Caedes, your images are very popular and for a reason, they're magnificent. Keep up the wonderful work. "-I see, said the blind man to the deaf mute." My recent gallery....... Select Image-» Typical Texas Sunset. this is so sweet. it almost looks real. very surreal and mystical. sweet. check out my stuff. Very very nice...its so...I can't put it into words...I don't know...unearthly. I'm honestly speechless. this is amazing and beautiful. perfect. Absolutley enchanting picture. I love how the moon reflects against the light. Just came across this and some of your others. Amazing! This is an excellent wallpaper, and i honestly think one of the best i have seen on this site. It's sense of scope and depth is amazing, and those walkers create a sense of how (some word here) the landscape is. Landscape is "out-of-this-world"! Mood is great! Horizon is just dreamy! You know your Bryce! Lovely render over all!